Plaza Mayor is one of the most famous sites in Madrid. Located right beside the modern city center (Puerta del Sol) it is hard to visit the city and not walk through the plaza. 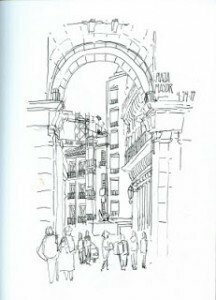 Today, Plaza Mayor is a major tourist trap – with its over priced restaurants and cafes, the hoards of tour groups passing through and the strange street performers displaying their “talents”. Sadly, most people don’t know that Mayor has been witness to some major historical – some very bloody – events throughout the years and has changed quite a bit through the decades. 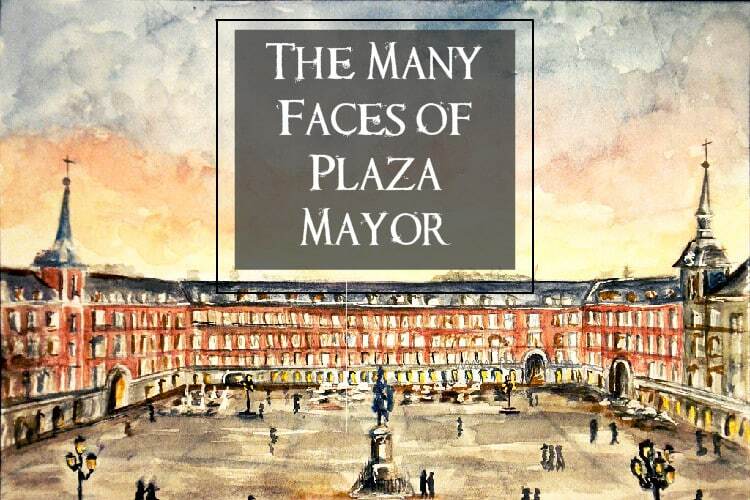 Let’s take a trip back in time and take a look at the many faces of Plaza Mayor. When Toledo was still the capital of Spain, madrid was only a small town, the area that is now called Plaza Mayor was known as Plaza de Arrabal and was not much of a plaza. It was a open spaced area in Madrid where traders, farmers and other tradesmen would travel from surrounding cities to sell their stock. In 1561 the Kingdom had outgrown Toledo and seeing potential in the wide open spaced Madrid, the King moved his court and declared the town of Madrid the new Captial of Spain. Madrid got a lot of traffic as most newcomers to the new Capital city had to pass through the market to enter the town, so the region became very popular. By 1577 King Felipe II declared it was time to make the market place an official plaza and employed Juan de Herrera to design and remodel the plaza that would be the new city centre and Royal headquarters. In 1619 the plaza was finally complete under the name of Filipe III. Throughout the 1600’s the plaza was completely obliterated by two separate fires, but was rebuilt in the same style each time. By this time in the plaza’s history Mayor was the place to be when it came social, state, and religious events. 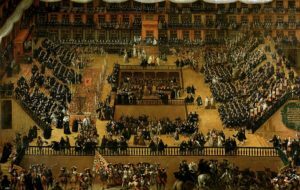 50,000 people would gather from all over the city to watch royal births/weddings/coronations, to celebrate holidays and of course to attend the ever famous Spanish bullfights! Probably the darkest but most intriguing period of Spanish history would be the Spanish inquisition. The inquisition was started in 1478 by the Cathorlic Monachs King Ferdinand and Queen Isabella to maintain the Catholic Orthidox way in an attempt to stop the mass numbers of converters. Though the Capital punishment didn’t start in the 1700’s, its became much more public and unrelenting. Plaza Mayor became the central location for torture and executions. Those running the “events” in the plaza were very creative – depending on your crime you would die from hanging, burned at the stake, or various forms of unique torture – and of course there was plenty of space for anyone who wanted to watch. Eventually the Plaza would burn down yet again and be redesigned to look more similar to what we see today. In 1834 under the reign of the most famous and respected monarchs Queen Isabella II the Spanish Inquisition was put to an end – the people in charge finally concluded that the inquisiton was doing more harm for their religion than good. During the 1800’s the plaza was renamed Plaza Real, Plaza de la Constitution and finally Plaza Mayor. Once things had calmed down in Spain, an equestrian statue of King Filipe III was erected in the center of Mayor, to honour the man who built it. Today it is a common place for local to meet and catch up. Now you can experience the amazing history of Plaza Mayor through pictures. 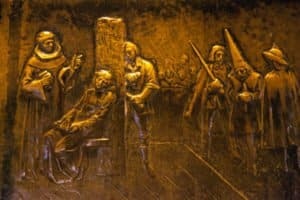 If you check out the carvings at the base of each light post throughout the plaza you will see some amazing visuals of the old market, the fires and the inquisition. Even though the plaza is now covered in tourists it still holds some historical flare – visit the plaza over christmas time to see the holiday markets and explore some of the shops to find some authentic bakeries and shops. The history in a nutshell! Thanks Leah! Plaza De Mayor is like having a nice summer lunch at Dachau! 30,000 executed on the same spot you are having the most delicious tapas.